D1=310mm/D2=328mm/H=370mm. Hobbock 25 litre made of tinplate, inside and outside blank. UN-Approval for dangerous goods! Inclusive lids, latch rings and splints. Hobbocks made of tinplate - Metal packaging with UN-Approval for dangerous goods! Our versatile, robust Hobbocks are best-suited as metal packaging for liquid and solid hazardous materials and filling goods on solvent-base (VOC), like paints, varnishes, glazes, oils, pastes and waxes. 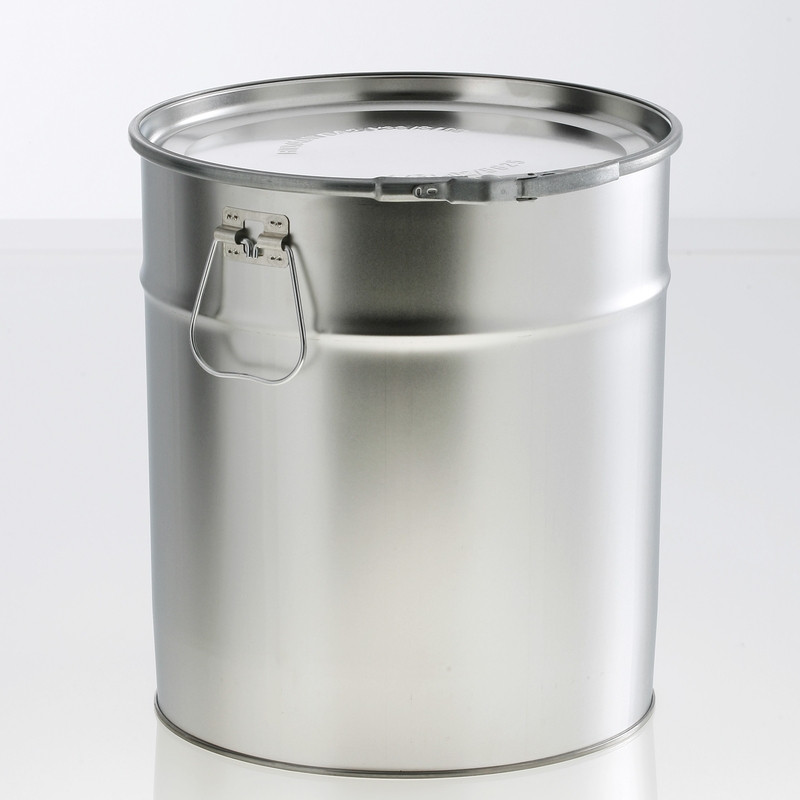 Metal pails with higher filling capacity are generally called Hobbocks. These Hobbocks are inside and outside blank. Due to the PVC seal in the lid, these Hobbocks are NOT suitable for groceries. Our conical Hobbocks are ideal for economical storage, as they can be optimally nested and stacked. Optimal emptying is achieved by the large opening of the pails. The ringless, thin bucket edge makes it easy to pour out the contents cleanly. All Hobbocks with approval for dangerous goods are delivered inclusive matching lid, latch ring and safety splint. Using the latch ring, the Metal bucket is firmly attached to its lid. The latch ring will additionally be fixed with a splint. Through the latch ring, the Metal pails remains tightly closed during transport. These Hobbocks are also equipped with two metal carrying handles on the side. Due to the rubber seal in the lid, the Hobbocks provide high tightness and storage stability for volatile materials. All Hobbocks are made of tinplate (tinned sheet steel). Pails made of tinplate without an appropriate inside coating are not suitable for water-containing filling goods or moist storage/handling. Contact with water or moisture can lead to rust. (Number embossed on the container)!